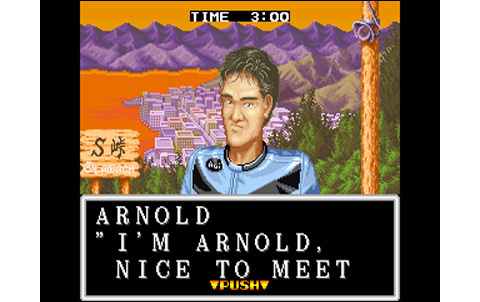 All right, I'll beat you! Released in 1990 with the first wave of Neo Geo games, Riding Hero was the first... and also the last motorcycle game on the console. 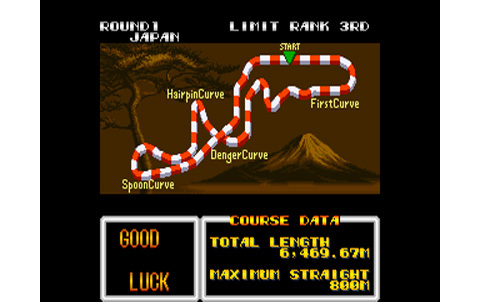 Not really an expected title , even if its realization was quite good back in its time, but it didn't enthusiasted crowds as well, like Magician Lord, Cyber Lip or even Top Player's Golf did, back in theses marvelous days. 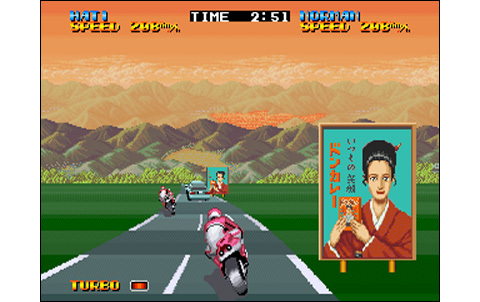 The game invariably reminds about Sega's Super Hang-On, but the main difference is that Riding Hero features a story mode. 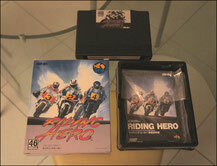 And this makes it one of the few "RPG" for the Neo-Geo. 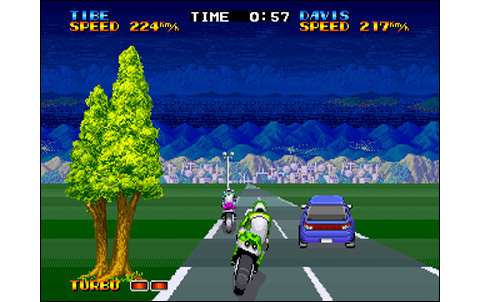 I remember being addicted to it when I was a kid. 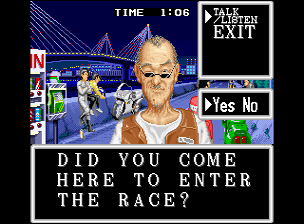 The great adventure, I totally fell in love with the atmosphere of the game, being immersed in a world of street motorcycles racing. 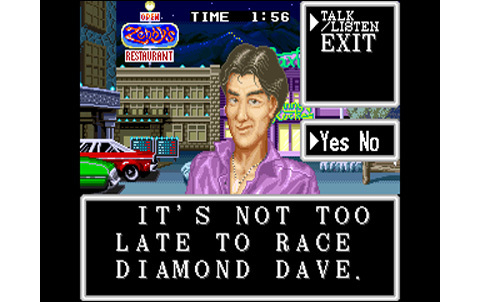 The challenge, the need to earn money to buy a better bike and improve, always beat the opponents to finally come to the clash against the mysterious Diamond Dave... and then win the eight hours of Suzuka. 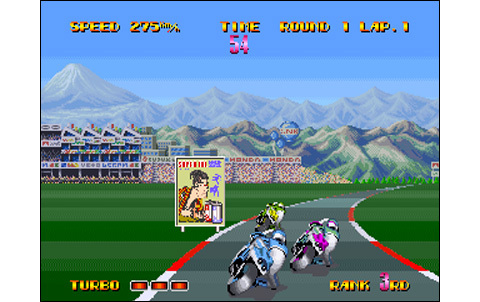 Your opponents, when they decide to outrun you, they just touch your rear tire "by accident". You will start a spin, and ostensibly might take a pole or a tree on the roadside (nine times out of ten). Meanwhile, the opponent will continue his race without even balance would be felt... Annoying, right? With a little practice, you come to anticipate this trouble inherent to the gameplay, to avoid this kind of disappointment... But other problems remain. 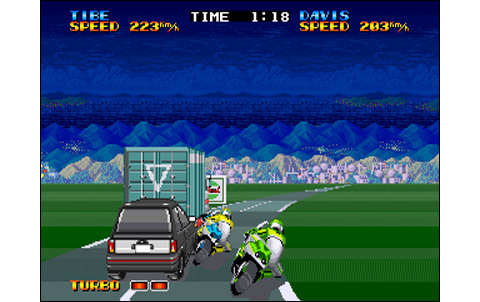 Vehicles that we cross during the races are always the same at the same places, the pilots always drive the same way, the bike runs choppy, the brakes are useless (well, as often in arcade racing games). 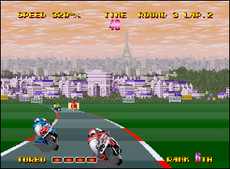 Super Hang On was doing much better in this point of view. 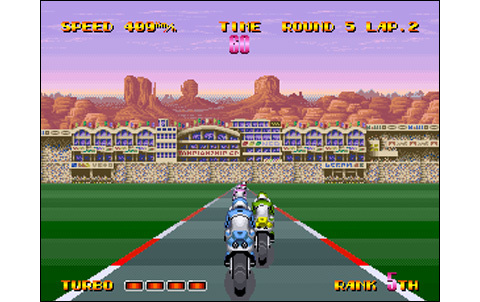 The realization doesn't really raise the level: graphics are quite nice on the sets and characters in the story mode, but tracks, cars and motorcycles are barely worthy of a Genesis, and are moreover poorly animated. Even the engine sounds are really basic. But where are the 46 megs then? Few digits, poor effects during races, only the ones accompanying the adventure are nice. Concerning the musics, they're quite successful. Without offering an exceptional quality, the various themes are catchy. 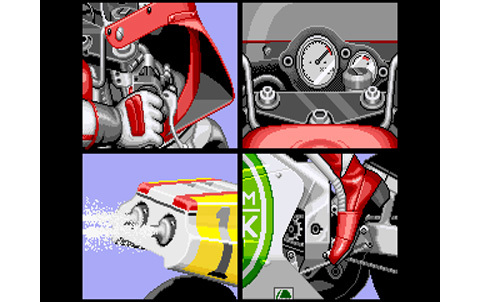 Overall everything is average, including the animations that were not worked enough: the capabilities of the Neo Geo with zooms remained in the garage, and the steps of animation for the different vehicles, but most for our bike, can be counted on the fingers. 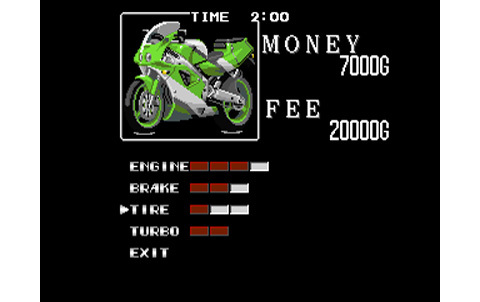 Outrageous for a game running on the Rolls'Royce of videogames. 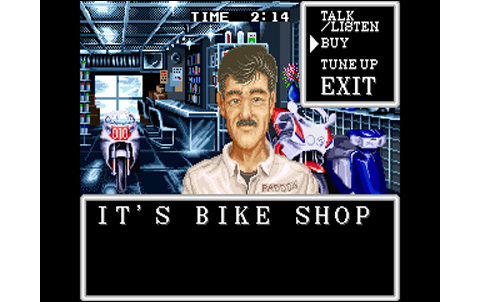 This is unfortunate because the idea of an RPG in the world of Japan street bikers was really nice... so, don't throw stones at Riding Hero. 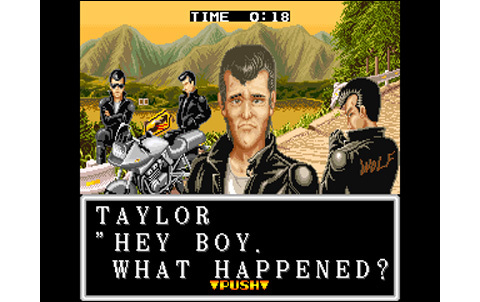 Certainly, SNK has not been good on this one. A few more weeks to polish the game, more playtests, a few more megabytes if required would have fixed everything. 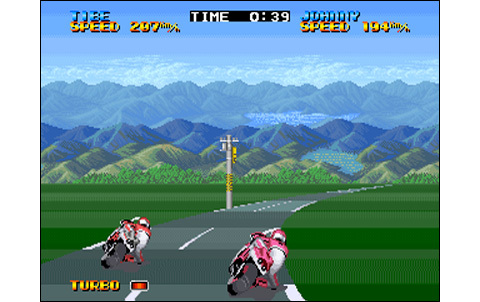 For the animation, programmers only had to copy Hang-On, which was very good at this, and use the Neo Geo capabilities. Why make it worse? That said, if you can forgive its very limited realization and poor gameplay, immersing yoruself in the story mode can be quite cool... Now, it's up to you to decide! 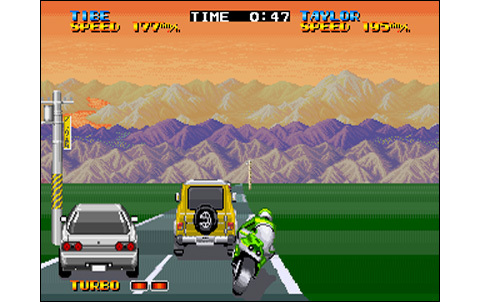 Not really bad, but the roads and everything around don't fit the Neo Geo standards. Only places and characters in the story mode are not too bad. 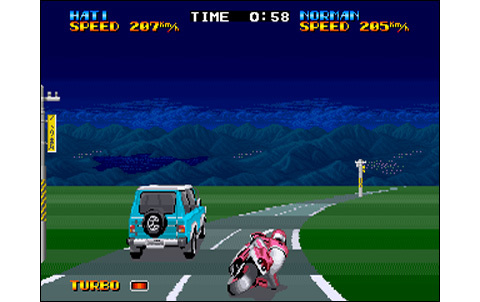 Really deceiving: zoom abilities are not used, the motorcycle has few animation steps... Even the speed sensation is not really awesome. 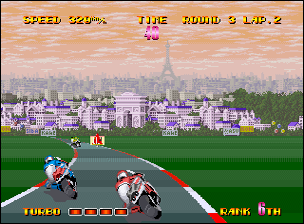 Sound effects during races are average, but musics are doing good and the various sounds during story mode are nice. 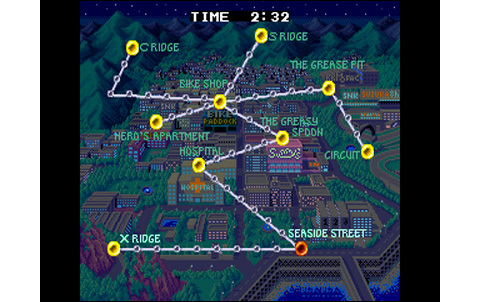 The adventure is quite long and catchy, but driving phases are so boring... However, RH still packs a good scenario and a nice atmosphere. 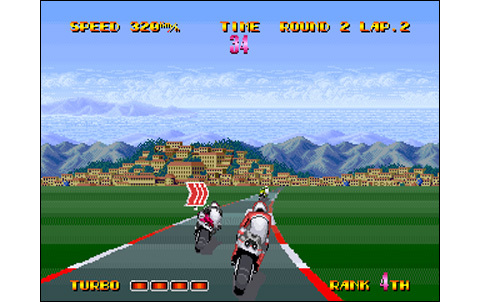 The game is not fair, the motorcycle turns slowly, it's easy to fall and opponents never fall, them... Quite boring! 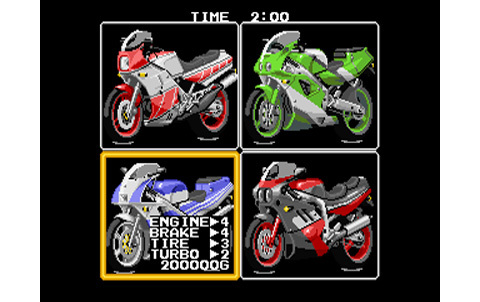 A cool story mode, penalized by a poor game engine, poor dynamics and a boring driving. 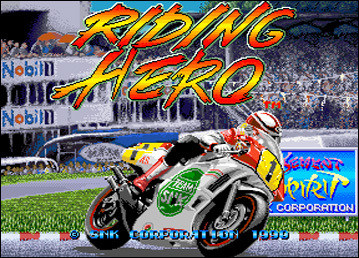 If you want to try the cool and addictive story mode, provided you can override the average realization AND deal with the evil gameplay.... then I encourage you to play Riding Hero, which is worth forty euros.